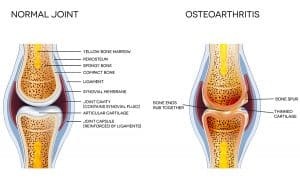 Do You Suffer With Osteoarthritis? Our Chicago Arthritis Specialist Can Help! Do you miss the active lifestyle you enjoyed before your arthritis took over? Scientific evidence has demonstrated that cellular orthopedic treatment can stop the progression of your osteoarthritis – and in some cases even reverse it! You can significantly reduce and possibly even eliminate your arthritis pain. Your rehabilitation will be prompt, and the procedure carries exceedingly minimal risk. When compared to the outcomes and potential complications of joint replacement, cellular orthopedic treatment with Dr. Sheinkop, our Chicago arthritis specialist provides an incredible alternative for patients suffering from arthritis. As an experienced physician, Dr. Sheinkop can thoroughly assess osteoarthritis symptoms and partner with you to find the best solution for your pain. Want to learn more? Click here to learn how cellular orthopedics and Dr. Sheinkop can help patients in the Chicago, IL, Milwaukee, MI, and Madison, MI, areas.